The City of Zeeland and the Macatawa Area Coordinating Council partnered to receive a grant from the Michigan Department of Environmental Quality to implement water quality BMP demonstration sites within City-owned facilities. Two sites were chosen within the City, one is a City Park that serves as a gateway to the community, and the other is the City’s Street Maintenance Facility. Niswander Environmental was instrumental in choosing these sites for the grant and intended them to be a highly visible demonstration to the public of innovative stormwater management techniques and the City’s commitment to improving the local water resources. Prior to commencing this project, the City retained Niswander Environmental to create a Master Park Plan that highlighted the water quality features desired at the park. Niswander Environmental was then hired by the Macatawa Area Coordinating Council to design and construct these sites to fulfill the grant requirements. Niswander Environmental designed the sites to reduce phosphorous loads in the watershed through sediment removal. Both sites were intended to be not only functional, but also formal in nature due to their high visibility. The Park site included an innovative design to address the steep slopes that are present. The design utilizes a bioswale with satellite raingardens that transports stormwater runoff from the heavily trafficked road that borders the site, down a steep slope through terraces. The water quality features at the Park will infiltrate and treat the stormwater prior to its release to Noordeloos Creek. The Street Maintenance Facility is also an innovative demonstration of stormwater management as it highlights a detention basin retrofitted with a rain garden. It is immediately adjacent to a traditional, maintained detention basin to offer a differing view. The rain garden treats stormwater from the site that enters as overland flow and through a direct outlet that carries the facility’s roof runoff. Niswander Environmental completed a planting plan for this site that included specially chosen species based on different wetness zones experienced in the rain garden and their ability to adapt to extreme environments. 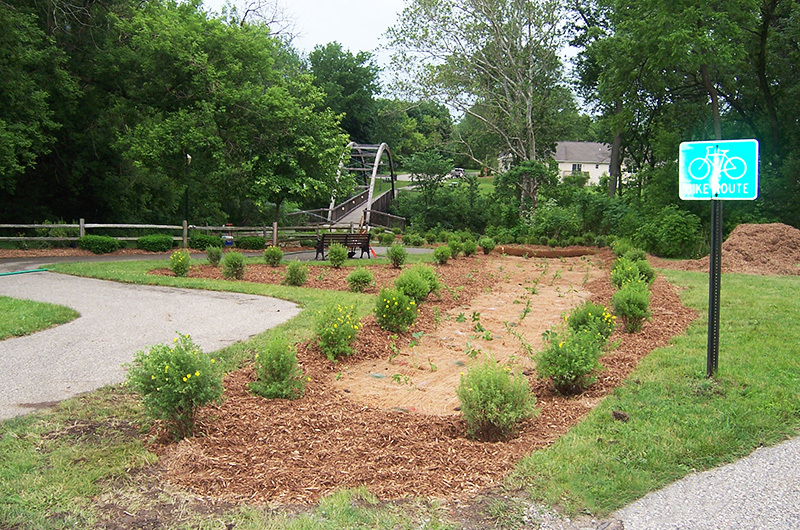 The sites were constructed in June 2008 and the MACC coordinated a volunteer planting day with local citizens and organizations that helped to install the plants at both sites. Niswander Environmental oversaw all aspects of the earthwork and planting.